There’s no denying the fact that we live in an amazing place, in a mountain valley that looms over deserts to our east and rich agriculture valleys to our west. Tehachapi was forged from its very beginnings to be unique, set apart from our neighbors, outside of the mold that has been cast around us. You could credit this to science, or a creator — that’s your business. But I know where I stand and what has been placed in our hands is nothing short of divine. We were provided with God-given assets, and now it’s our man-made (or woman-made) abilities that keep this place moving forward. I’ll use water as an example. Our Tehachapi Valley water basin is managed by the Tehachapi-Cummings County Water District, which was created in the 1970s to bring water uphill from the state aqueduct to help ease an over-pumped basin. Fortunately, since then, through adjudication, dispersal of water rights agreements and proper management by TCCWD and other water partners in the area, we were able to revive our God-given assets with man-made brainpower and cooperation. The geography didn’t make Tehachapi an easy place for the railroad to pass through, but when they managed to blow through granite to create our rail corridor, our community and eventually our city was born and located near the rail terminal. Since then, as the railroad business model shifted, we have made the Depot Museum a key component to downtown Tehachapi, and one of the marquee features of our community. Other downtown projects followed suit and now we have the most-enviable downtown in Kern County. God-given geography, man-made success. The wind and renewable energy industry took advantage of a natural asset. A nuisance to some, the wind was harnessed in the 1970s and today renewable energy from the various surrounding wind turbines powers homes across the state. Some of the companies that manage these projects are located right here in Tehachapi, and employ talented individuals in our community for both wind and solar projects. God-given resources, man-made energy. Tehachapi plays a critical role in the support of the nearby defense, aerospace and private space industries. These industries took advantage of the resources available: open air space, desert landscapes, a place prime to military installments. That matured into aerospace testing, engineering and development of some of the world’s most impressive aircraft and defense systems. They landed space shuttles on a dry lake bed and Tehachapi residents took part in first the government-led and now privately-led exploration of space. Today we’ve seen those efforts ramp up in the form of companies like Virgin Galactic and others that continue to test aircraft capable of taking people into space with Tehachapi being home to many of those who put those systems into orbit. God-given landscapes, man-made exploration. It’s the uniqueness of Tehachapi that places a burden on each of us to continue to make it special. 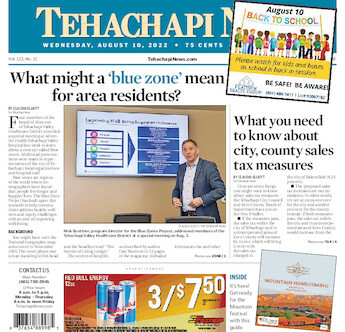 Recently at a City Council meeting a woman came to the podium and said that she didn’t want to see Tehachapi turn into Anytown, USA. That’s exactly the mentality that we share as a city staff and with our elected leaders. It’s not just pride in our city, it’s a sense of duty to take advantage of all that is around us to ensure that our community stands out as unique, beautiful, and a great place to live, to work and to thrive. We haven’t been placed in this location at this time in history for nothing. We’ve been provided with some very impressive God-given assets, abilities and resources. It’s on us to make the best of them and we’ll continue to do so together. Greg Garrett is Tehachapi's city manager.